Learn about Chemcycle, UC San Diego's chemical recycling program. Chemcycle is UCSD's chemical recycling program operated by Environment, Health & Safety (EH&S). UCSD researchers can obtain free chemicals and donate usable surplus chemicals. Chemcycle is good for the pocketbook and good for the environment. Search and order free chemicals online through marketplace.ucsd.edu. We pick up and deliver! In the search box, type in the material you are looking for and click search e.g., trimethylpentane. Look for the UC San Diego Chemcycle logo or check to see if UC San Diego Chemcycle is listed on the lower left corner of the screen (By Supplier Name section). Choose the Chemcycle, then just add it to your cart and check out. 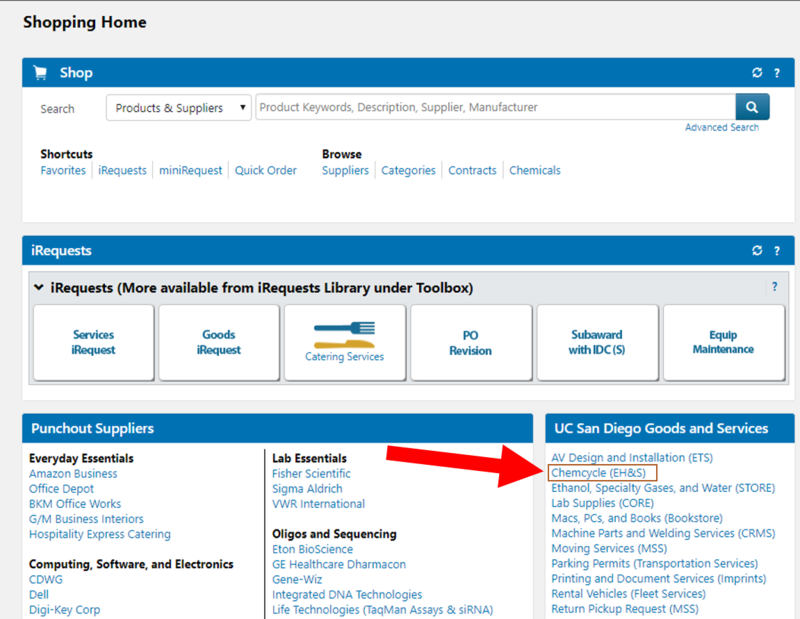 Click on the Chemcycle (EH&S) link on the UC San Diego Goods and Services sidebar and look at all of the chemicals that are available, then again click on the material and add it to your cart. Standard delivery occurs during the next scheduled hazardous waste collection for your building. Contact the EMF, (858) 534-2753, for urgent deliveries (dependent upon delivery personnel availability). Chemicals must be in the original manufacturer’s container with original labels intact. Chemcycle acceptable chemicals: non-potential peroxide forming, virgin, unused factory sealed containers, e.g., acetone, ethanol, methylene chloride. Chemcycle does not accept any mixtures, solutions, samples, expired, or degraded chemicals, e.g., research by-product, spent material, hazardous waste. Use the Online Waste Tag Program (OTP) to have EH&S hazardous waste technicians collect your usable chemicals. On the OTP's "Create Tag" screen, for "Indicate type of content" select Chemcycle. Complete and print a tag for the chemical. Request pickup for the container. Label the container with the waste tag and place it in your hazardous waste collection area. EH&S technicians will pick up the container on the next scheduled hazardous waste collection for your building. For more information, contact Chemcycle, (858) 534-2753.